Do you ever get frustrated looking for papers when it’s time to prepare for taxes? Here’s a simple system to organize paperwork ahead of tax season time. It helps save time and frustration from looking for important papers needed for taxes in multiple places. Whether you DIY taxes or pay a CPA, you’ll need to have important paperwork at your fingertips when you’re ready to do taxes. We choose to pay a CPA because she stays up to date with constantly changing information and we like to pick her brain about things we can do to improve our finances. Over the years, she’s helped us take advantage of every tax benefit possible so we’re comfortable with this way of doing our taxes. I’m sharing our tax paperwork filing system because it’s been effective to help us prepare for taxes quickly when it’s time to meet with the CPA. 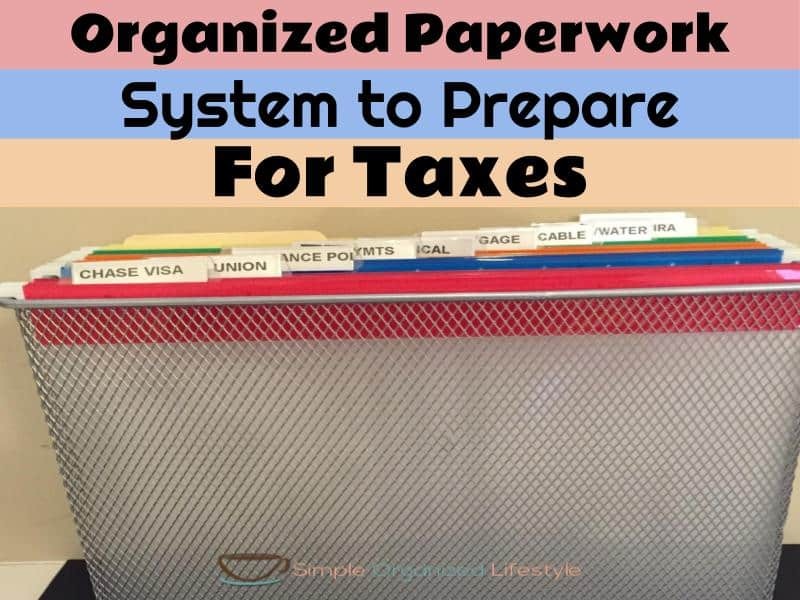 If you’ve struggled with getting things prepared for tax time, then maybe this will help give you some ideas for a system that will work for you. Even with opting for electronic statements whenever possible, there is going to be some paperwork involved when it comes to taxes. Some businesses only give paper receipts and going electronic still requires an end of year printout in most cases. 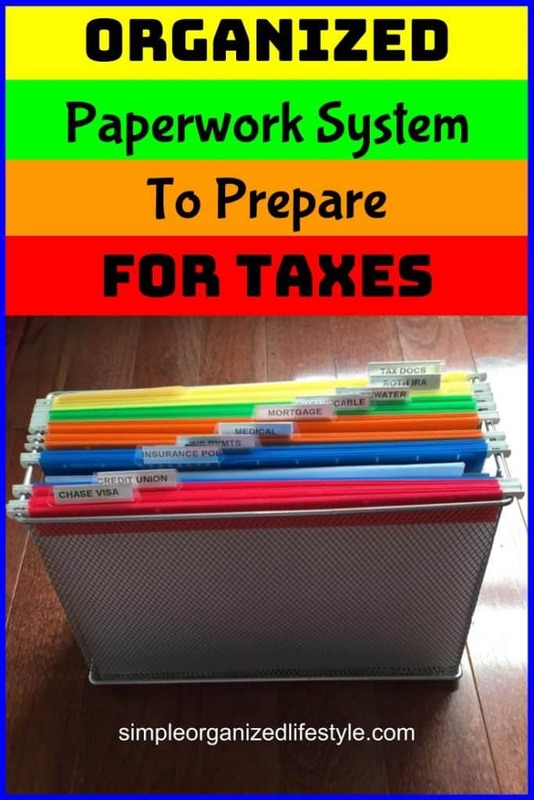 Our organized tax paperwork filing system is simple. It’s keeping a hanging file organizer throughout the year with a tab for essential information needed to file taxes. 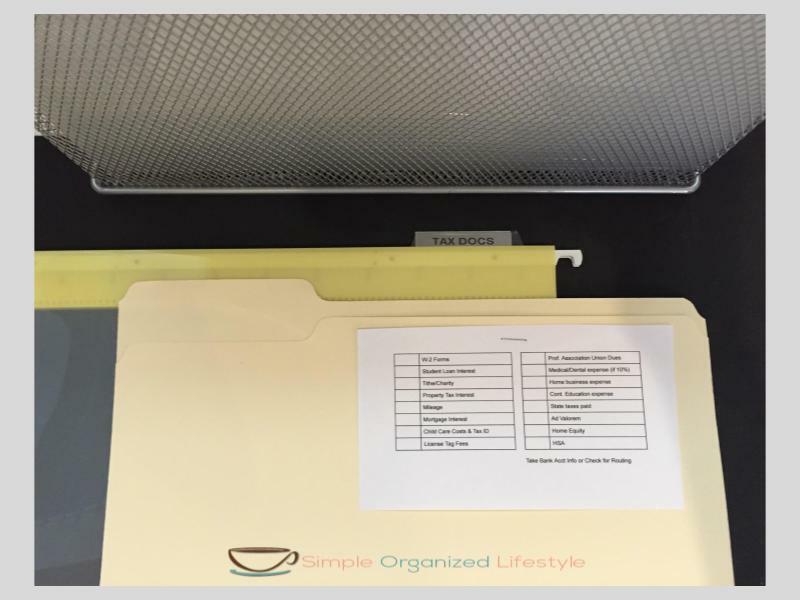 You can easily do the same with a simple organizer and some file folders. One file folder contains a checklist for all statements we need to take to the tax office. I just staple this to the front of a manilla folder, put it in a file labeled “Tax Docs” and check off items as we put them in the folder. Take a look at your tax returns from the previous year. What was the essential information needed to file taxes? What were your tax deductions? Those become items to check off on your tax doc folder. After the final December invoice has been paid, we pull everything out of each file folder and place them into stacks. If it’s a category that’s used for our taxes, we run a calculation ahead of time to take to the appointment. My husband writes off mileage since his job requires travel but does not provide a vehicle. He uses a (paid) app that keeps up with it for him through the year. He syncs the app with Excel to calculate those totals ahead of our tax time. My grandfather is a plumber and he uses a legal pad and writes down every single transaction from the year and then one of us runs a tape on an adding machine. Even though his method takes much longer, it’s the way he likes to do it and it still works for preparing for tax time. Create a spreadsheet for totals of the categories, or simply write the totals on the front of the folder that contains all of your tax docs. This gives you an entire glance at a year in one place. It’s not only good to have for tax prep, it’s great for comparing year to year and making adjustments to improve your finances. On the day of taxes, we take our tax doc folder, and that’s all we need. Then we file our completed returns for 7 years. The rest of the paperwork from the current year is either recycled, shredded, or kept with the tax returns. Any other suggestions for being prepared for tax time? Feel free to leave them in the comments!